I have been doing really well with my fitness goals this year, sticking with healthy food and snack choices. But, Valentine's Day is right around the corner, and even though Jason and I don't really celebrate the holiday, I have decided I will be treating myself to a little cheat dessert that day. I fully plan on indulging in some chocolate, and this delicious Brownie Torte from Golden Blossom Honey will be on the menu for Valentine's Day in the Mahoney household this year. 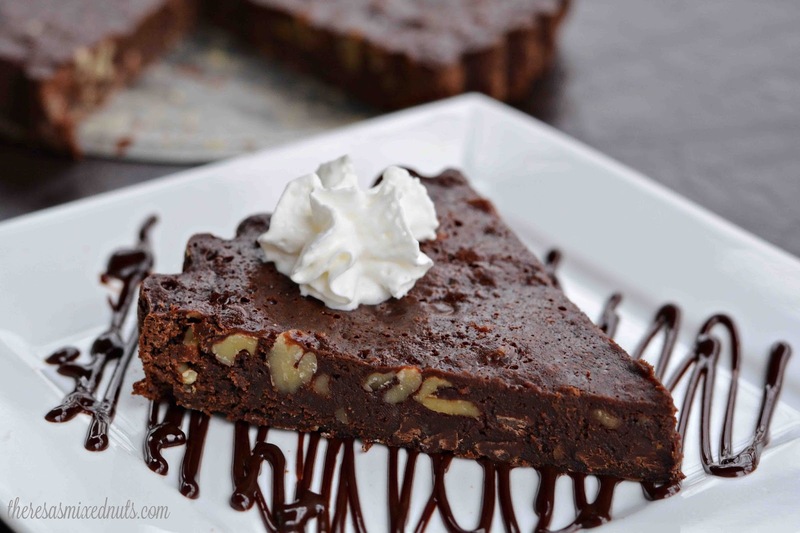 A yummy chocolate torte filled with walnuts and chocolate chips is rich, decadent, and is a chocolate lovers dream! Are you serving any sweet treats for Valentine's Day this year? Definitely worth a cheat moment. That looks great to me! Looks legitimately nom! And simple! Wouldn't call it a torte, though, methinks torte is when you have layers and fillings between them the European style, this would be a cake. I am intrigued with the usage of honey, because I've always wondered if sponges can be done with it instead of sugar. I think you are right about the layers. I did just do a quick Google search and it seems some call it a torte made this way and some do it with the layers. I don't care what it's called, I'll eat it all the same ;) Maybe a nice frosting layer on the top would give it even more pow. I'll have to try that! It's not a sponge type consistency, more of a fudge texture, so the honey does well with it. I've dumped condensed milk over spongy cake and if you go light, it soaks it in without making it soggy, so I am sure the same could be done with honey. Forgot to ask you if all is well in your life, sister? I've noticed that you've been posting more sporadically in recent months and you haven't been posting your usual giveaways as often as in previous years adn months? Ooh, a bathroom! Such an exciting project! Did we paint the kid's room yet? Recessed lights would be fabulous, but our ceiling is at an angle. We thought a skylight, maybe, but I really don't feel like spending more than we have to on it. I am hoping that when Allison goes off to college in 6 years, we can downgrade in house size. I'd really love me a one story house that doesn't take forever to clean each day. But, dahlink, you have such lovely blues in your house, I am sure you decorate it so it is cozy, no? I'm sure you have just the right touch to turn any dump into something fit for a king! What? You can clean your house each day? Who does that? :) I do it maybe three times a week and goodbye Charlie :) You could put lights around the mirror, those are ever so lovely and make us look prettier in the mirror. I do. When you have 3 dogs, 2 kids and, well, Jason, it's kind of a must to clean daily :( Mondays I deep clean the entire house, so the rest of the week I can just spot clean where needed, then sweep and mop each day. Keep it nice and simple, Adam. That's a good way to go! Oh my gosh!! Yummy and simple. I love it!! That looks amazing! 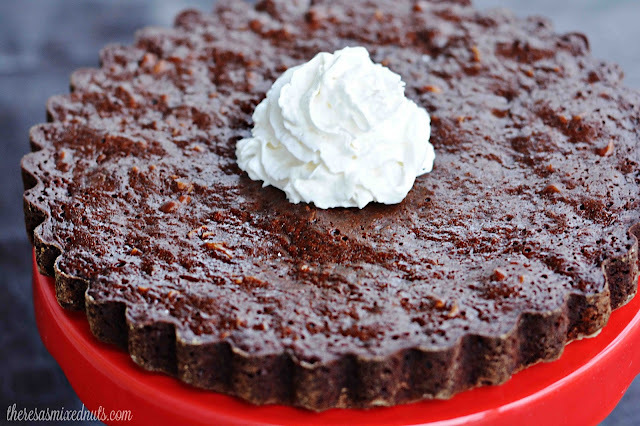 I love a good chocolate recipe and Valentine's Day is the perfect excuse to make this tart. That looks sssooo good! I love tortes, so I'll be trying this recipe. You had me at simple. If there's one thing I love more than delicious, it's simple. My kids would love if I had this! It looks so good! Thanks for sharing. I usually have mini chocolate boxes siting at their breakfast plate in the morning on that day. I think your blog had a makeover since I last visited? It looks incredible! And so does this recipe! I would have never known that honey is an ingredient. Yum! Oh my gosh. I got so sidetracked dreaming about that torte. That looks spectacular. Wow, this looks delicious and I love the simple ingredients. I'd love to make it as a special dessert! These look tasty for sure. I plan on sharing this recipe with my family. Ohhhh, Mama that looks good! Brownies are one of my dessert weaknesses. I wouldn't share a single piece. This looks super delicious! I will have to try to make it! I must eat it up! Boy does this sure look good! What a great Valentine's Day treat. That looks super yummy! Wonder if I give my husband the recipe if he will make it for me! Simple you say? I can't bake to save my life let alone to have some fun. But I'm good at buying brownies. Anyone interested? OMGoodness that looks delicious. I've only seen tortes in bakeries and yours looks even better! We haven't planned anything for Vday either but oh goodness.. I might do some baking myself after seeing this ;) Jason is a lucky man! !